Updated Friday April 12, 2019 by Rod Reyes. Senior Night for Moreau Catholic Boys Varsity Volleyball featured three former All Saints CYO Alumni. Congratulations to Carlos Lopez, Evan Mao, and Ryan Simmons on finishing up their high school careers. Also in the house representing the defending NCS Division I Champions Irvington Vikings was none other than another All Saints alum Mateo Castillo. Mateo is wrapping up a stellar four year varsity career with the Vikings that includes the aforementioned NCS title, and hopefully one more this year. 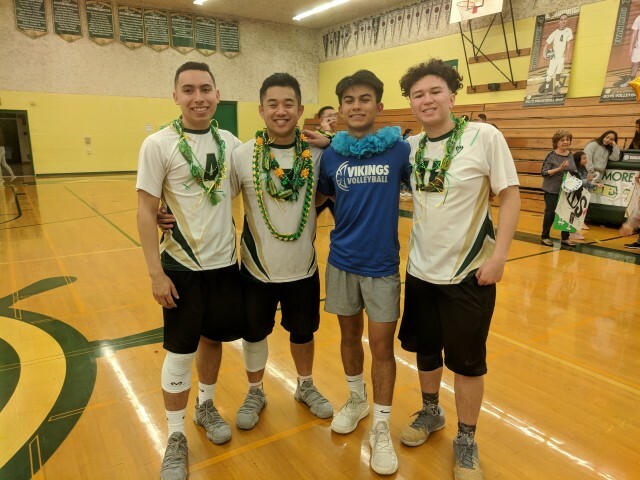 All four of these players started playing volleyball just six years ago when the boys volleyball program at All Saints CYO was brought back. Their enthusiasm and love for the game led them to continue not only in high school but club volleyball as well. We wish them all well as they head towards graduation and beyond!